Hospice of the Red River Valley is committed to making educational and support opportunities available to our communities. We are offering grief support programming in several communities this spring, including Ellendale, Enderlin, Fargo, Lisbon and Valley City, N.D., and Detroit Lakes, East Grand Forks, Mahnomen and New York Mills Minn. Classes include Journeying Through Grief, How to Help a Grieving Friend, Six-week Educational Grief Support Groups and Youth Journeys. Registration is required for all classes because space is limited. All classes are free of charge; however, donations are always welcome to help offset the costs involved. For questions, call (800) 237-4629 and ask to speak with the bereavement department. 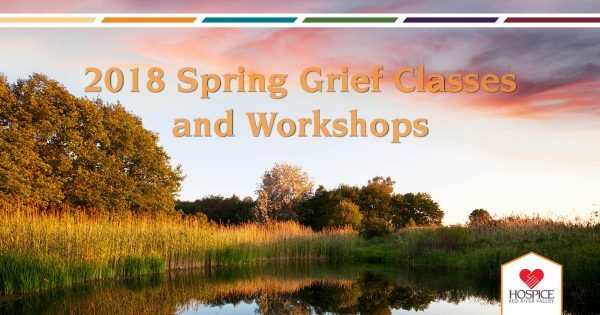 For more information or to register, view our complete 2018 spring grief class schedule.